Last year America's premier Christian rock label Tooth & Nail/BEC Recordings signed a band originally from Florida, Among The Thirsty. In 2014 the group's single "What Love Looks Like" was released and now their record label album debut 'Who You Say I Am' is getting enthusiastic reviews. Talking about the album Ryan Daniel, lead singer of the pop rockers, is extraordinarily candid. He said, "The first five songs were done well before we even moved to Nashville, and then the next five were pieced together as my life fell apart. That's the irony of it. The record tells a story of getting to rock bottom, finding God's gift of desperation and then climbing out of that hole by realising who God says you are and what you're worth." 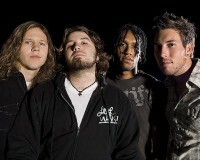 Forming in Clearwater, Florida, in 2008 Among the Thirsty's original line-up consisted of Daniel as the lead vocalist, Brian Henderson on guitar and Brock Douglas on bass. They got their name in an unusual way, as they told JesusFreakHideout. Said Ryan Daniel, "The band name honestly came out of thin air. Brock and I were teenagers and trying to come up with a band name. We were attending a worship event/concert and the band leading worship was called Jimmy Lumpkin And The Grain. As soon as Jimmy got off stage we asked him, 'Hey man, what should we call our band?' He quickly responded with 'How about Among The Thirsty?' and it just stuck. Years later, he found us on Myspace (showing our age here) and we reconnected. We asked him about where that band name suddenly came from [when he said it], and he let us know that he was simply just thirsty from playing a show." The band released their first independent album 'Among The Thirsty' in 2005 and the following year issued 'Homeward Bound'. Reviewed at the time Cross Rhythms wrote, "Moving from the stadium rock of 'The Arms Of Love' to the bluesy 'The Love Song', with acoustic slow-burners like 'Homeward Bound' in between, Among The Thirsty have delivered a varied set of songs that showcases their versatility as a band." In 2007 the mini-album 'A Very Thirsty Christmas' was released and two years later came the album 'Wonder'. A customer on Amazon enthused, "I was hooked right from the opening song 'Do Over', an up-tempo rock song that reminds me of 'Great Lengths' by PFR, one of my favourite Christian bands. 'Don't Sit Down' is even more rocking and keeps the strong message going with the urge 'don't give up the fight.' The song 'I'd Need A Savior' is a gorgeous ballad about the attributes of Jesus and deserves the success it is having." The success of 'I'd Need A Savior' ensured that it showed on the R&R Monitored AC chart, which was an unheard of feat for an unsigned act. In truth, Among The Thirsty weren't prepared for the popularity of the single and as a subsequent biography confessed, "didn't have the bandwidth to capitalize on its success." Reflected Daniel, "We were circling the runway and trying to figure out what kind of band we wanted to be." The group relocated to Nashville shortly after and eventually added two new members to round out their five-piece: guitarist and keyboardist Riley Donnell and drummer John Wall. The 'Who You Say I Am' album was recorded in Atlanta with Daniel's longtime friend, acclaimed producer Scotty Wilbanks (Third Day, 7eventh Time Down). Wilbanks had his eye on Among The Thirsty since they were teens, playing shows before they were even out of high school, so working with him at the helm felt like a natural partnership. Said Ryan, "Scotty and I cranked out five tunes and it became apparent that we had something worth pursuing on our hands. We took those five songs and turned them into an unreleased EP (which Scotty produced), simply for shopping to labels and management. Once we solidified a deal with BEC, I wrote 60 more songs. We selected five of those 60 and turned our unreleased EP into the full-length album." Ryan was asked why the song "Who You Say I Am" was chosen as the album title. He explained, "The process of putting together this record was very lengthy and during this process I had some pretty rough patches in my life. During this rough time I sat down with some pals and we cranked out this song called 'Who You Say I Am'. It touched on the difficult and ongoing battle between what we think of ourselves and what God thinks of us. I grew up in a church where, if you were naughty, God was disappointed. However, that is the farthest thing from the truth. God does not become 'disappointed' with his children. He is sovereign, he is never surprised or thrown off guard. He calls us His own. I KNEW these things, but I had never really allowed them to speak into my life and to take hold of me." Ryan admitted that the mammoth songwriting sessions to complete the album was crucial in him resolving the inner turmoil he found himself experiencing in Nashville. He explained, "I was on this journey of coming clean, losing and finding out who I am, and who I'm not. I wrote a lot of these songs on that journey, and it became clear that the real deep issue was 'identity.' I, like many others, was struggling with identity. I had tied my identity and who I was and what I was worth to things that I shouldn't have. I learned the hard way that you cannot bond your identity with anything that can be taken away. When we draw who we are and what we need from ANYTHING other than the Father, we will eventually start to feel empty. It's a slow burn; it's a long process but it's a fact. The thing that I was drawing from was a relationship. It wasn't healthy because I wasn't healthy. I didn't love myself and I didn't know who I was and I didn't treat myself and the ones I loved the way they needed and deserved. That relationship came to a bitter end and when it did, my whole world turned upside-down. Rock bottom is not an enjoyable place to be, however it is one of the most precious gifts. God knew my every step, he knew where I was and he allowed me to go through that, because it was at 'rock bottom' that I found God's 'gift of desperation.' I surrendered everything, I gave up my freedom and though the process was difficult, it was the most freeing and incredible experience and it saved my life."